Your local supermarket probably stocks watermelons and maybe even round, yellowish lemon cucumbers, but does it offer cucamelons? 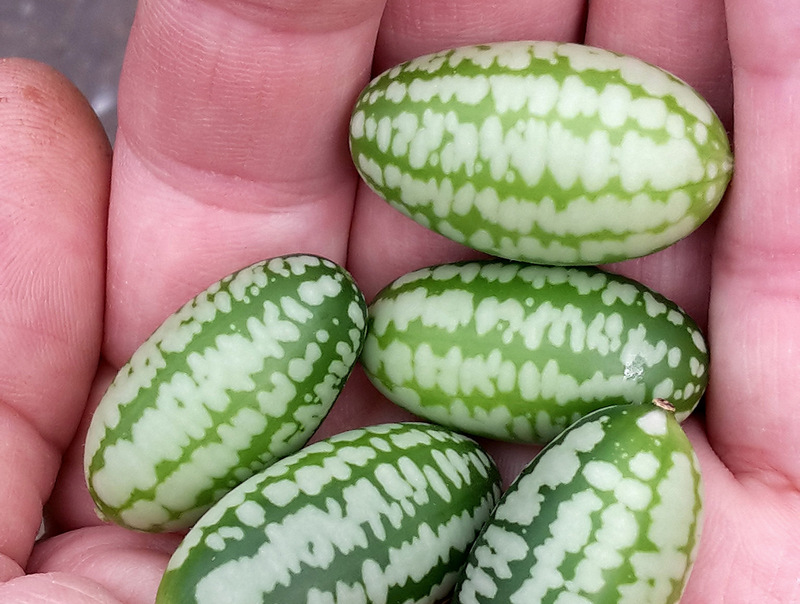 This tiny, green-striped fruit grows on a vine and looks like a cross between a tiny watermelon and a squat little cucumber. While the cucamelon isn't technically new - people have been eating them in what is now Central America since the time of the Aztecs - its adorable appearance and novelty in North America make it a new star in farmer's markets. Can’t find cucamelons at your farmer’s market? While August is probably too late in the summer to start growing your own (unless you live in Hawaii or the very warmest parts of the Southern US), you can bookmark these green cuties in your favorite seed catalog and look forward to starting the seedlings early next spring. Cucamelons are reputedly easy to grow and even if your garden consists of containers on a balcony, you can still grow them up a trellis or inside a tomato cage. While you might be tempted to Instagram them instead of cooking, you can slice up tiny cucamelons to make a refreshing, colorful radish salad. If you don’t want to slice up the adorable baby watermelons, you can also serve them whole as a garnish on a summer cocktail – try spearing a cucamelon on a swizzle stick and serving it with a refreshing mint julep. 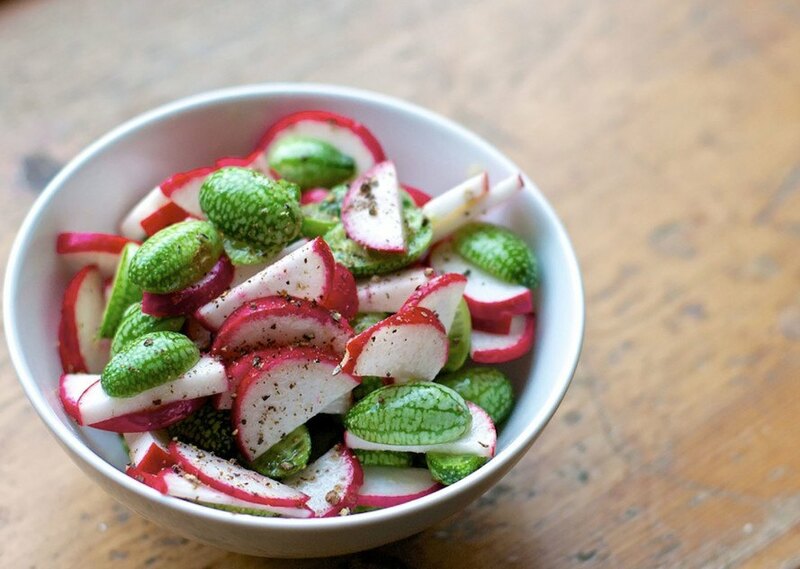 You’ll need about 14-16 cucamelons, 5 radishes, rice vinegar, fresh dill, sea salt, and freshly ground pepper. Slice the cucamelons lengthwise and add them to a salad bowl. Slice the radishes into thin rounds and mix in. Drizzle the salad with about 2 tablespoons of rice vinegar. Toss with a generous pinch of sea salt and a few grinds of black pepper. Garnish with fresh dill fronds and serve. Serves 4. Can’t find any cucamelons to cook with? Try one of these refreshing summer recipes made with watermelon or cucumber instead, and bring along to your next BBQ or picnic. You’ll need one small seedless watermelon, or about 4 cups of diced watermelon with seeds removed, 2 bananas, 1/2 cup coconut water, and 1 one-inch piece of peeled fresh ginger root. Pop cubed watermelon in the freezer for a couple hours, or until completely frozen. You can prepare extra frozen watermelon in plastic bags or food storage containers so its ready to use later. Fire up your blender and drop in the coconut water and peeled ginger. Blend until the ginger is well chopped. Add the 2 bananas and blend. Finally, add the frozen watermelon and blend until creamy and smooth. Serve in a glass with a straw and enjoy! Serves 4. You’ll need: 2 cups of Greek yogurt, 2 large cucumbers (or 4 small Persian cucumbers), 1 small clove garlic, sea salt, freshly ground black pepper, juice of 1/2 lemon, and 2 tablespoons of fresh chopped dill. If you’re using regular large grocery-store cucumbers, you’ll need to peel the thick, bitter skin off first. If you’re using thin-skinned Persian cucumbers, you can simply wash them and chop off the ends. Using a box grater, grate all of your cucumber into a bowl. Squeeze the grated cucumbers gently and drain off any excess water and juice. Finely dice the small clove of garlic. 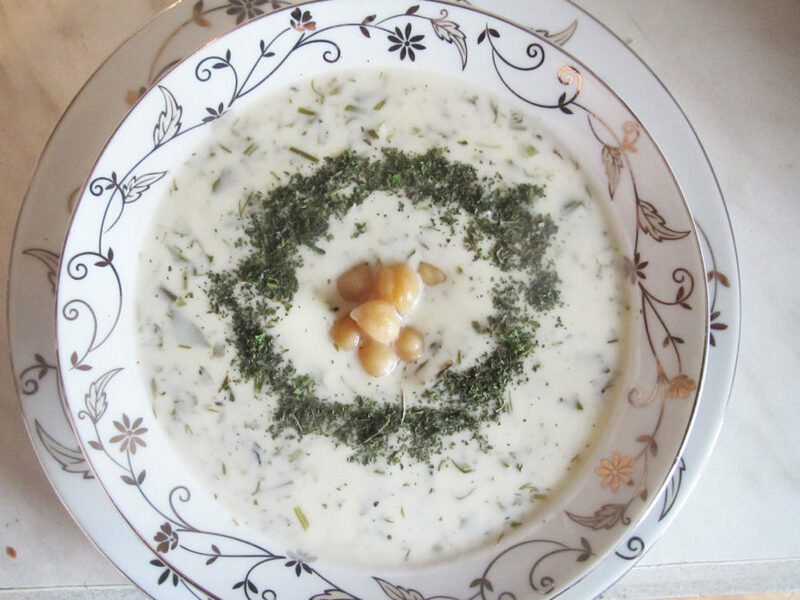 In a bowl, mix the two cups of Greek yogurt with the grated cucumber, diced garlic, juice of 1/2 lemon, and chopped dill. Add a generous pinch of sea salt and some ground black pepper and taste, adding more if desired. Let the dip sit in a covered dish in the refrigerator for an hour to allow the flavors to blend. Serve with crackers, pita chips, or freshly warmed baguette or pita bread. 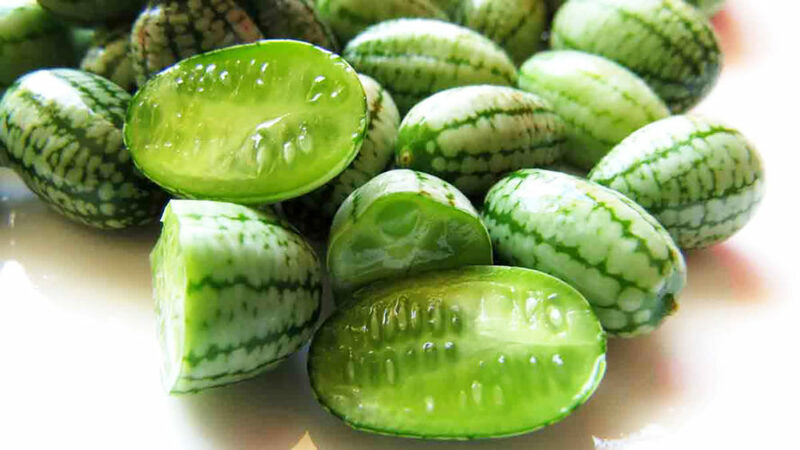 The cucamelon, Melothria scabra, is similar to a cucumber with a crisp bite and an aromatic, citrusy flavor. Its petite striped appearance lends it a number of alternative nicknames, from "Sandia de Raton" ("Mouse Melon") to "Mexican Sour Gherkin". While you might be tempted to Instagram them instead of cooking, you can slice up tiny cucamelons to make a refreshing, colorful radish salad. If you don't want to slice up the adorable little baby watermelons, you can also serve them whole as a garnish on a summer cocktail - try spearing a cucamelon on a swizzle stick and serving it with a refreshing mint julep. Cucamelon-Radish Salad Step One: Gather your ingredients You'll need about 14-16 cucamelons, 5 radishes, rice vinegar, fresh dill, sea salt, and freshly ground pepper. Step Two: Slice and mix Slice the cucamelons lengthwise and add them to a salad bowl. Slice the radishes into thin rounds and mix in. Drizzle the salad with about 2 tablespoons of rice vinegar. Toss with a generous pinch of sea salt and a few grinds of black pepper. Garnish with fresh dill fronds and serve. Serves 4. Can't find cucamelons at your farmer's market? While August is probably too late in the summer to start growing your own cucamelons (unless you live in Hawaii or the very warmest parts of the Southern US) , you can bookmark these green cuties in your favorite seed catalog and look forward to starting the seedlings early next spring. Cucamelons are reputedly easy to grow, and if you garden consists of containers on an urban balcony, you can still grow them up a trellis or inside a tomato cage. You'll need about 14-16 cucamelons, 5 radishes, rice vinegar, fresh dill, sea salt, and freshly ground pepper. 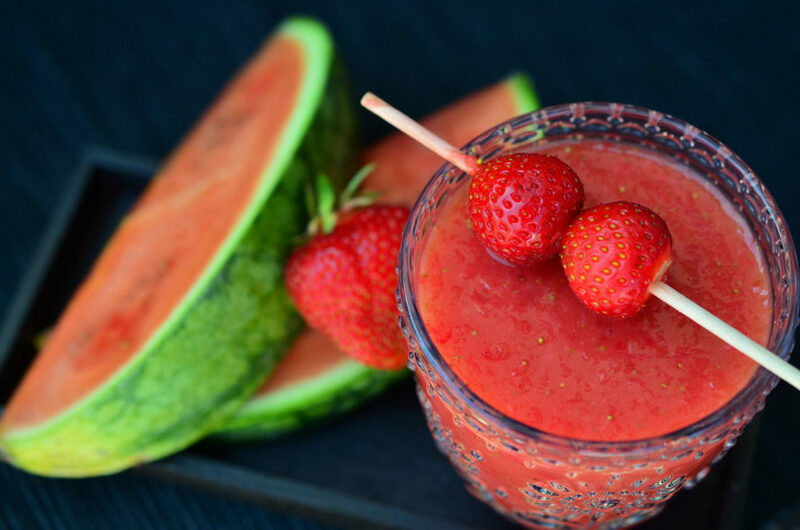 Frozen Watermelon Smoothie Step One: Gather your ingredients You'll need one small seedless watermelon, or about 4 cups of diced watermelon with seeds removed, 2 bananas, 1/2 cup coconut water, and 1 one-inch piece of peeled fresh ginger root. Step Two: Freeze Pop cubed watermelon in the freezer for a couple hours, or until completely frozen. You can prepare extra frozen watermelon in plastic bags or food storage containers so its ready to use later. Step Three: Blend Fire up your blender and drop in the coconut water and peeled ginger. Blend until the ginger is well chopped. Add the 2 bananas and blend. Finally, add the frozen watermelon and blend until creamy and smooth. Serve in a glass with a straw and enjoy! Serves 4. Yogurt-Cucumber Dip Step One: Gather your ingredients You'll need: 2 cups of Greek yogurt, 2 large cucumbers (or 4 small Persian cucumbers), 1 small clove garlic, sea salt, freshly ground black pepper, juice of 1/2 lemon, and 2 tablespoons of fresh chopped dill. Step Two: Grate and dice If you're using regular large grocery-store cucumbers, you'll need to peel the thick, bitter skin off first. If you're using thin-skinned Persian cucumbers, you can simply wash them and chop off the ends. Using a box grater, grate all of your cucumber into a bowl. Squeeze the grated cucumbers gently and drain off any excess water and juice. Finely dice the small clove of garlic. Step Three: Mix dip In a bowl, mix the two cups of Greek yogurt with the grated cucumber, diced garlic, juice of 1/2 lemon, and chopped dill. Add a generous pinch of sea salt and some ground black pepper and taste, adding more if desired. Let the dip sit in a covered dish in the refrigerator for an hour to allow the flavors to blend. Serve with crackers, pita chips, or freshly warmed baguette or pita bread. The cucamelon, Melothria scabra, is similar to a cucumber with a crisp bite and an aromatic, citrusy flavor. Its petite striped appearance lends it a number of alternative nicknames, from "Sandia de Raton" ("Mouse Melon") to "Mexican Sour Gherkin."